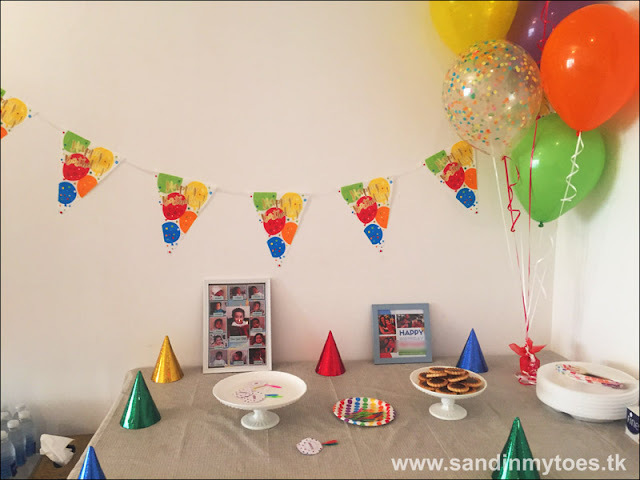 A rainbow dots first birthday party! First birthdays are so special, which is why I started planning Little Guy's birthday well over a month in advance. We prefer doing small gatherings at least for the first few birthdays as the kids are too small to remember and they get less overwhelmed this way. On the other hand, it's not easy organising a party at home. It was even more of a challenge for me because I have two little boys to take care of, with no house help. So, most of my party planning was done with sleepy eyes after they had gone to bed. Thankfully, I didn't have to do every little thing myself. I had the support and help of some amazing businesses based here in the UAE. I thought I would share my party ideas, as well as information of these companies, so you can think about planning birthdays and any special occasion without worrying about how it can be accomplished. 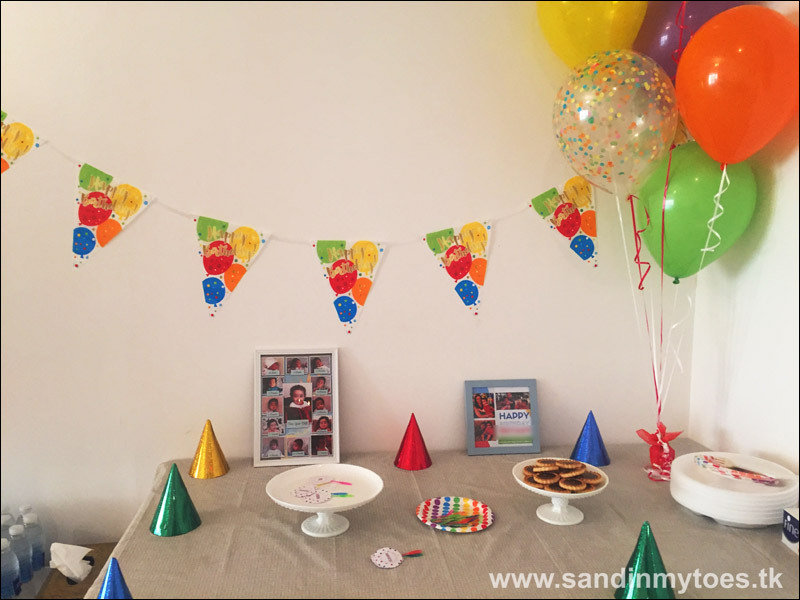 The party theme was very simple - rainbow coloured polka dots against a white background. Babies love colours, so I thought the birthday boy would enjoy this. To bring the theme to life, I wanted the centerpiece of the party to be a photo backdrop. My idea was a cloud with rainbow drops/dots. 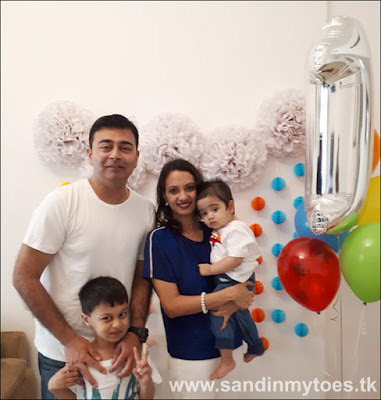 Luckily, I had the expert help of My Little Bucket, party planners and party supplies shop based in Business Bay, Dubai. 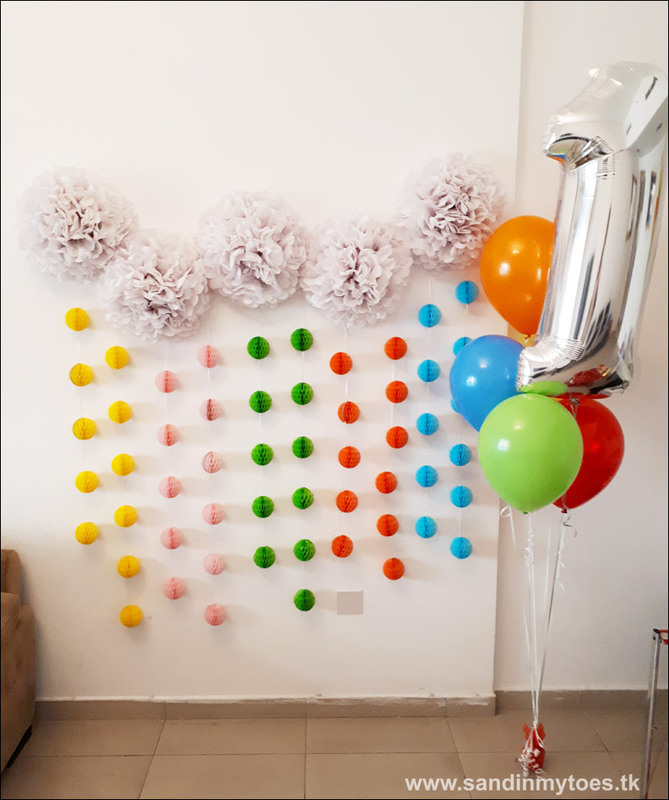 Working with their team, I explained what I wanted, and they took care of the wall backdrop and the helium balloon decorations. Daniel from their team created the cloud using white puffs, and the drops using pom pom strings. It looked amazing, as you as can below! I love how it made the perfect decor for photos with guests, and for cutting the cake. Little Guy was so fascinated by the pom poms! We had two balloon bouquets from My Little Bucket. 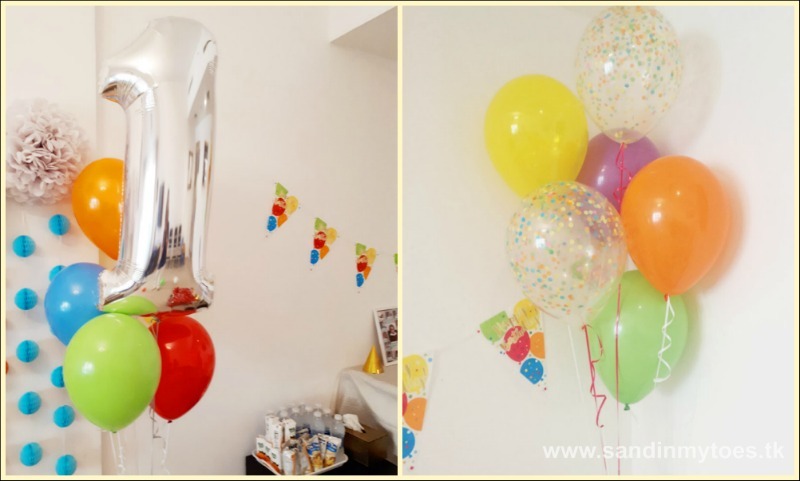 The bigger one was a foil number 1 with rainbow coloured balloons. The second was placed on the food table. 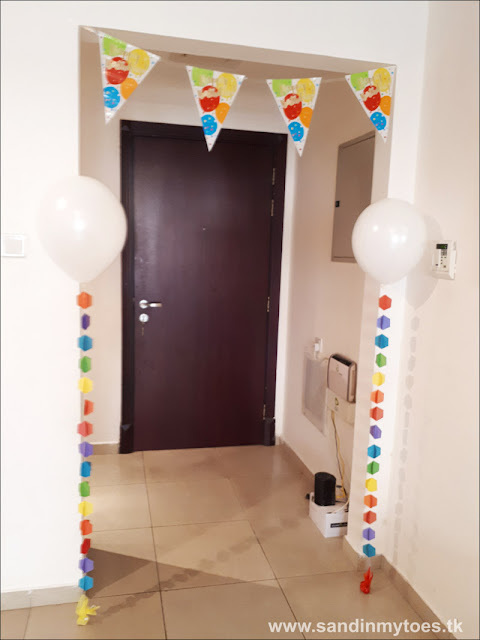 This had confetti balloons (to match the dot theme) and rainbow balloons. To add more colour to the room, we placed two white balloons with rainbow tassels at the entrance. The polka dotted banner was also from My Little Bucket. 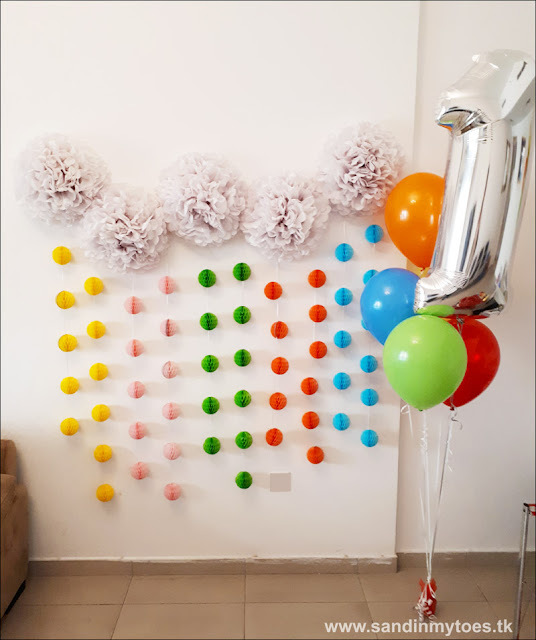 You can order party supplies online from www.mylittlebucket.com or contact them on 050-2619684 to plan your whole party with soft play, kids' entertainment, photo booths, and more. 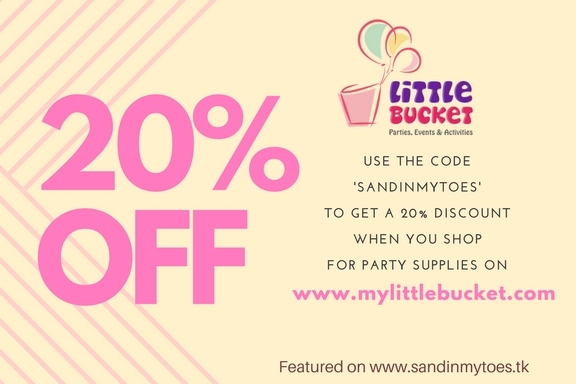 They have also graciously offered our readers a 20% discount for online purchases using the code 'sandinmytoes' on checkout. On the food table, I kept it fairly simple, not wanting to serve too many sweets and considering we would be serving pizza for dinner later. As snacks, I served chocolate tarts and fresh fruit cups (not pictured below). As decor, I used a few party hats and some dotted cupcake toppers I found online. I made two frames with collages - one showing a photo of Little Guy for every month since he was born. The other was a photo greeting card. I found some great templates on HP Photo Creations, a desktop software with so many built-in design templates for photo printing. 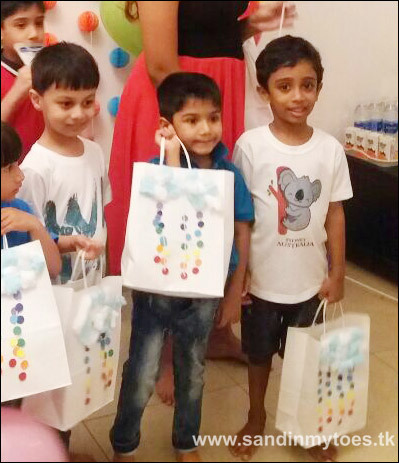 The design of the goodie bags complemented the decor so much! This was thanks to the amazing company, My Goody Goodie Bag. This creative company allows you to design a goodie bag online according to your theme. For me, they offered a custom service to design an exclusive goodie bag based on the rainbow cloud design. I think they did a great job with it, especially since each bag is hand made. They worked with me to choose the contents of the bags for the ten kids we had over. Gifts were chosen according to the age and gender of the child. For instance, the main toy for the boys was a truck, and the girls got a floral headband, Each child also received bubble wands. They also had a tag with the child's name on each bag, which just made it extra special. Needless to say, the kids were really thrilled with their goodie bags! 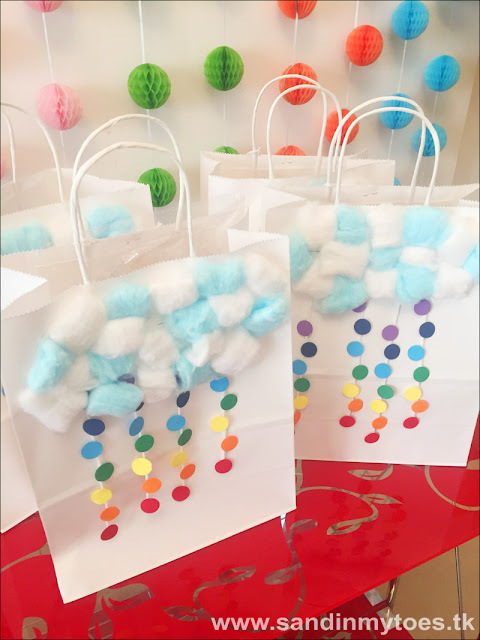 It's really easy to order your own goodie bags for an upcoming party by visiting www.goodiebags.ae, and choosing how you want it to look from their exisiting designs, and what you want in them. You can also have them custom made by contacting them on 056-8382444. 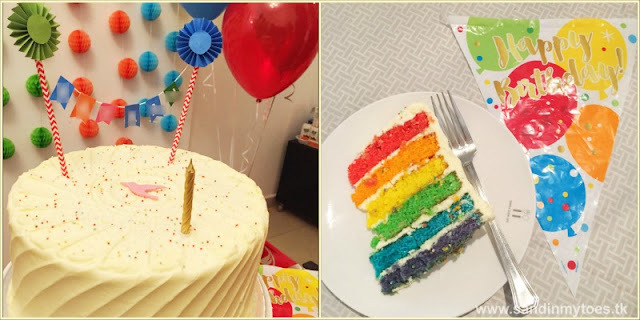 I felt the rainbow cake from Hummingbird Bakery was best suited for the theme, because it's white on the outside with the rainbow coloured layers revealed inside. I ordered online from them, and received the cake around the time they said they would deliver. To decorate it, I had made my own cake topper using a rosettes template from the blog, Skip to My Lou. You can find it here. Inspired by her birthday cake bunting, I designed one with his name on it. The topper really completed the cake, even if it took me two after-hours nights to make! Overall, the party was a memorable one. The kids had fun with some simple party games and prizes. The birthday boy loved seeing all the kids around, and everyone had a good time. This was indeed such a fun party. Master Z loved his goodies, and that cake was so delicious! Loved the little rainbow details throughout!